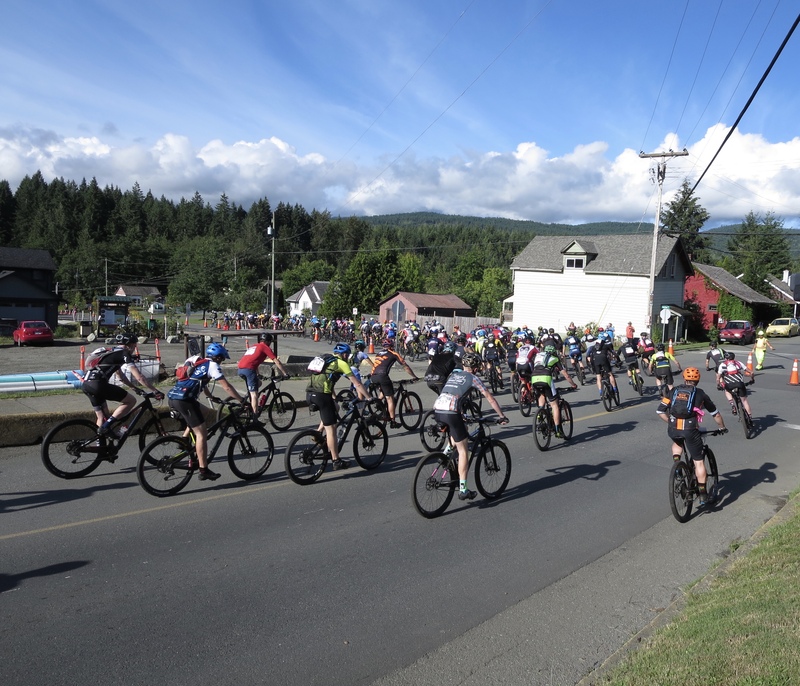 After three days of a rural retreat on Quadra Island in July, we headed for another mountain bike hub, Cumberland, the self-styled ‘village in the forest’ nestled in the Comox Valley on Vancouver Island. We were booked in for three nights at a local airbnb, a cute self-contained apartment with a full kitchen – so saving us a ton of dough cooking our own food – and oh joy, a washer and dryer; sweaty, rank bike gear no more! I hadn’t realized exactly how close to the trail system we’d be. A step out of the door from the converted attic above a nice family home, one, two, three turns of the pedals, a couple of moments coasting down the road on a gentle incline and we were suddenly in the woods and starting up a forestry road. No driving to a trailhead, no fighting traffic, no muss no fuss. 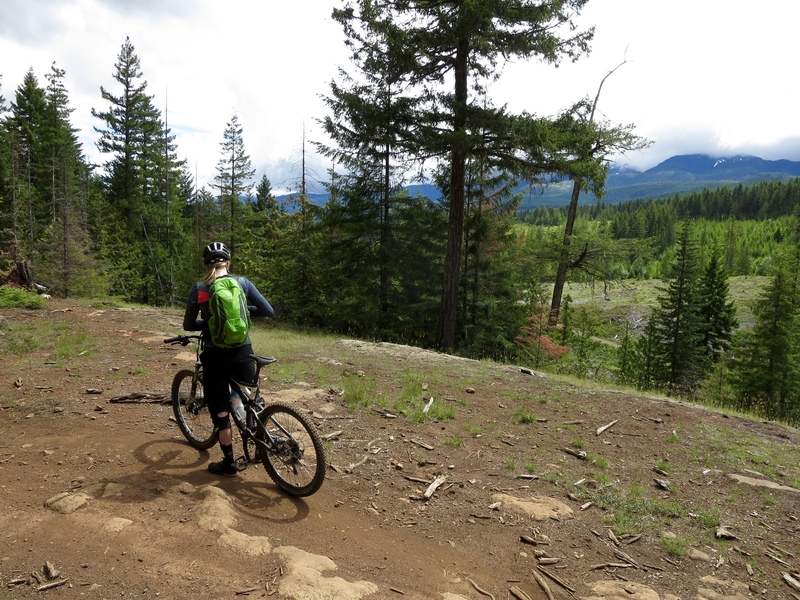 The trails in Cumberland are excellent; well-maintained, clearly marked, extensive, fun and challenging when you want. Thanks to the efforts of the local bike club, the United Riders of Cumberland, the agreements they hold with private landowners have allowed the development and maintenance of a vast network of trails in a working forest. Additionally, the Cumberland Community Forest Society has over the last few years been raising funds to buy parcels of forest adjacent to the town and in the process are protecting an important ecological, recreational and historical area. Cumberland attracts riders from around the world. The last day of our visit the town hosted the second stage of the BC Bike Race, ‘the world’s best mountain bike race’ ~ Outside Magazine. The race next year is already sold out. We watched as over six hundred riders shot past our airbnb into the woods early in the morning, the spin of so many wheels buzzing like a vast hive of bees. The local sports field was a sea of red tents set up for the riders that night, and were just as suddenly gone the next day, on to another stage of the race in another town. Bike races aside, for all its popularity as a mountain biking destination once we’d ridden up the forestry road and veered off on the first of many trails we saw at most a handful of riders each day. On the second day dark clouds hove into view as a deep rumble of thunder sounded. Despite its throat clearing the sky spared us all but a spattering of rain and lightning. We traversed a web of trails that led us up into great swathes of logged, open land; stumps and replanting abounded instead of thick forest. At other times we were led back into gorgeous woods that had been temporarily spared the chainsaw or were soon to be felled, judging by the brightly coloured plastic ribbon that adorned them. I’m conflicted about the areas we rode in. 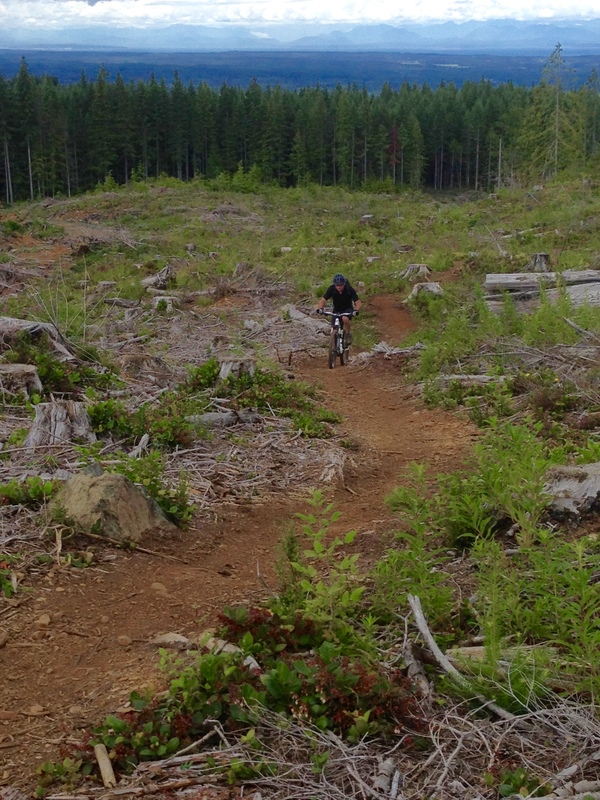 The trails are brilliant: loamy, rocky, rooty, flowy, techy, take your pick. But the cleared areas jarred. The forest society notes on their website that all unprotected forest is to be logged. Replanting can’t hide the evidence of chainsaws at work (at this point of the growth cycle anyway). Where new growth reached just over our heads, it was easier to deny the logging – the inevitable out of sight, out of mind. In a way Cumberland is a lesson in survival and evolution (I highly recommend a visit to the Cumberland Museum and Archives, we learnt a lot in a couple of hours one afternoon). With the discovery of coal in the 1800’s, Union, as the town was once called after the Union Coal Mining Company, grew rapidly, swelled by the arrival of Chinese and to a lesser extent, Japanese, immigrants to work the mines in harsh and dangerous conditions. As coal production gradually declined followed by the depression and WWII, many Chinese returned home whilst the Japanese endured forced internment during the war years. Chinatown and Japanese Town were dismantled. Logging replaced coal mining as the primary industry. Bolstered by the conviction that the forest is now worth more standing than felled, the community is ushering in a new economy. It’s nice that mountain biking is a vital part of this latest growth; Cumberland, with its artsy, craft beer, music, outdoor enthusiasts scene will have fully evolved once again. 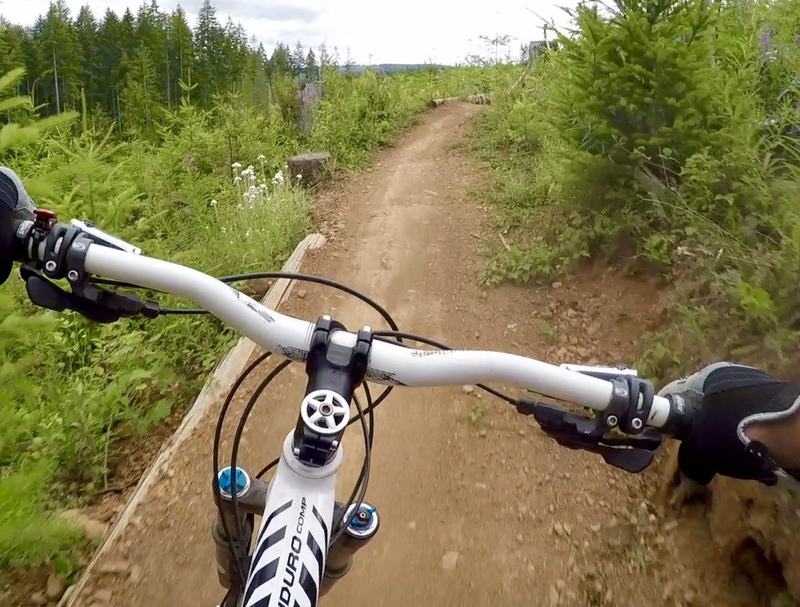 GoPro screen capture from Scott of Vanilla MTB, Cumberland. Flowy, bermy, fun!